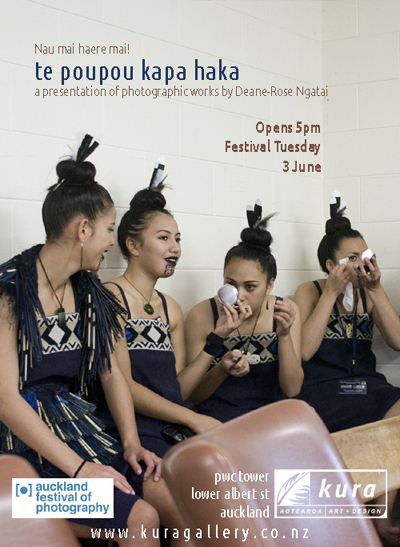 EXHIBITION Auckland – Te poupou Kapa Haka – A presentation of photographic works by Deane-Rose Ngatai – Kura Gallery: Maori and New Zealand Art + Design. Deane-Rose is currently studying towards a Master of Design by project at Unitec undertaking the Awatoru pathway. The pathway offers an opportunity to undertake projects that contribute to the economic and cultural development of the Maori community, while employing kaupapa and matauranga Maori approaches. Deane’s project titled He reo, he tikanga e whare nei i a taua – explores the significance of tikanga within urban M?ori education expressed through lens based media. This exhibition He poupou o te whakaruruhau e whare nei i a taua – presents images focused on a specific ‘poupou’ within the overall kaupapa of her project: Kapa Haka (Maori Performing Arts) within the urban Maori education experience of Kahurangi ki Maungawhau Kapa Haka at Auckland Girls’ Grammar, Kahurangi Whanau Unit. A former student of Kahurangi, Deane has documented ‘behind the scenes’ and Kapa Haka performances since graduating from AGGS in 2007. This series of images provides an insight into her community.